I was 15-years-old the first time I tried to teach myself how to apply self-tanner, and it was a complete and utter disaster. I was in Italy visiting my BFF at the time, and despite all of the sunless tanning tips she gave to me through the bathroom door, I ended up with a blotchy, orange tan that looked so ridiculous I was forced to spend the remainder of the summer sporting jeans and long-sleeved tee-shirts. I was too scared to get within 50 feet of a bottle of self-tanner after that horrible experience, and since I grew up at a time when the devastating effects of sun exposure weren’t as well documented or known, I spent more time than I like to admit baking my skin in the direct sunlight as it seemed the only way I could get a natural-looking glow. I sincerely regret all of the days I wore next-to-nothing at the beach with zero sunblock on my skin throughout my youth, and while I cannot change the past, the scar on my upper chest where I had my first skin cancer removed last summer reminds me daily how important it is to protect myself from the sun’s harmful rays. For the most part, I have come to embrace and love my pasty white skin, but I’d be lying if I told you there aren’t times when I wish my face, arms, and legs had a bit more color to them. So I asked the gals at our local tanning salon for their best sunless tanning tips, and I read and watched more tutorials on how to apply self-tanner than any sane person should, and I’ve decided to finally put my fear of self-tanning behind me. Check out my favorite tips and tutorials below, which will teach you how to get a natural, smooth-looking tan this summer without subjecting your skin to the sun’s harmful UV rays. I’ve included links to some of the best products and applicators on the market, a couple of tricks to ensure your tan doesn’t end up looking blotchy, and the best way to remove your self-tanner if it doesn’t turn out the way you hope. Before you even entertain the idea of applying self-tanner to your skin, it is really important that you take the time exfoliate. We’ve already shared a list of fabulous DIY exfoliating scrubs you can make using products from your pantry, but if you’re not a DIYer, I highly recommend Bath & Body Works Japanese Cherry Blossom Golden Sugar Scrub as it does a great job of removing stubborn, dry skin. Regardless of which product you make or use, smooth skin is essential if you want to avoid a blotchy tan, so make sure to give yourself a good scrub. And don’t forget to shave your legs! When I relayed the story of my first attempt at self-tanning to the young 20-somethings at our local tanning salon, they laughed a little too hard for my comfort level before telling me that the trick to getting a smooth application around tough spots like hands, elbows, ankles, and feet is to apply a moisturizer beforehand. They recommend the St. Tropez Tan Enhancing Body Moisturizer, but if you prefer something cheap and cheery, I’m sure my beloved Shea Body Butter from The Body Shop would work just as well. Just don’t quote me on that! While I’m a huge fan of drugstore makeup, self-tanner is a product I would splurge on. As you’re applying it all over your body, you want to make sure it looks good, so rather than picking up the cheapest alternative you can find at Walgreens, I would seriously consider investing in the St. Tropez Self Tan Bronzing Mousse as it’s been highly recommended all over the internet. I’ve included a bunch of YouTube tutorials below to teach you how to apply self-tanner properly, but before you scroll down and watch them, there are 2 applicators you will need: an application mitt and a buffer brush. Most makeup artists will suggest the St. Tropez Applicator Mitt (surprise!) and I really love my M439 Deluxe Buffer from Morphe Brushes, but I’m sure there are lots of other great alternatives out there. Just make sure to read the reviews of how they work with self-tanner as you want to make sure you get a smooth application. Once you’ve successfully applied your self-tanner, you want to make sure you take care of it so it doesn’t fade too quickly. The easiest way to do this is to avoid scrubbing at your skin, so take a break from exfoliating and don’t rub your skin with a towel after you shower, and ensure you apply a good moisturizer each day. In the event that you end up with a tan that is either too dark or too orange, or that ended up looking splotchy despite your best efforts, don’t freak out! My tanning salon friends recommend applying coconut oil to your skin and allowing it to set in for 30+ minutes, and then removing the oil with the Bronze Buffer Self-Tan Remover in a hot shower. Oh, how I wish this product existed when I was 15!!! If you’re a visual person like me, I’ve included 5 YouTube Tutorials below to show you the correct way to apply self-tanner. Many of the tutorials use the same techniques, but they each include different tips and tricks, so I highly recommend you watch them all before you take the plunge into the wonderful world of sunless tanning! If you want to learn how to apply tanner evenly for a natural-looking tan, this tutorial is loaded with great tips and tricks! Lauren shares the same tips as Jaclyn, but I wanted to include this tutorial as she confirms the St. Tropez Self Tan Dark Bronzing Mousse is one of the best-smelling self-tanners on the market, and also doesn’t fade off in splotches. 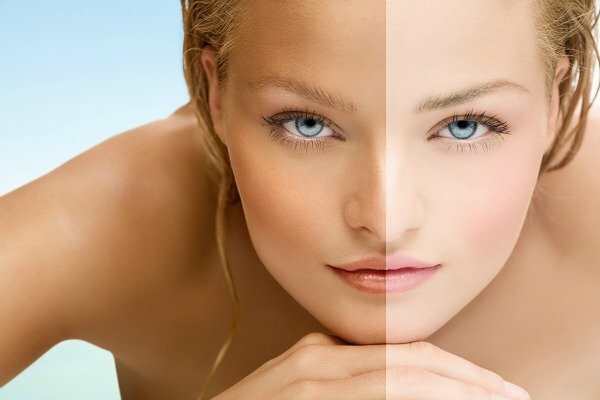 This is a great review of different sunless tanners. I love how honest Jaclyn is, and that she includes a range of products for different looks (dark tan, light tan, long-lasting tan, etc.). If you’re looking for a collection of great tips and tricks for a gorgeous, natural, sunless tan, this is another great tutorial! If you want to learn how to make your fake tan look less orange, check out this trick from my favorite makeup artist, Wayne Goss! I wish I had known all of these sunless tanning tips when I was younger. It would’ve saved me a lot of pain and heartache during that awkward summer when I was trying to impress the boys on my Italian adventure, but in an era where sun exposure is so incredibly dangerous, I’m glad I’ve finally learned how to apply self-tanner properly so I can add a bit of color to my skin without risking my health. If you found these tips and tutorials to teach you how to apply self-tanner helpful, please share them on Pinterest! And if you’re looking for more beauty tips and tricks, please follow our Beauty board where we share the latest and greatest!